February on With Love and a Little Self-Deprecation is dedicated to love. 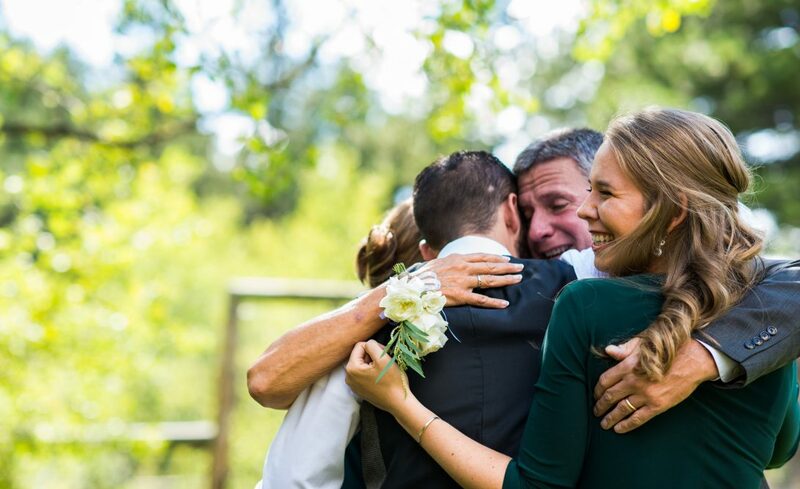 Family love, friendship love, marriage love, “that wasn’t even close to being” love – just lots and lots of love. But in a funny way, I promise. Today’s My Funny Valentine post, a shout out to my OG Home Team and all their wonderful weirdness. Every family has one. Okay maybe you don’t have a matchbook urn specifically, but you have something weird that your family has just accepted as truth. A wonky toilet that won’t flush unless you jiggle the handle just right. A squeaky stair that everyone just skips over at this point. A family recipe for a casserole that no one really loves but everyone keeps making. You understand. Our family had our thing too. 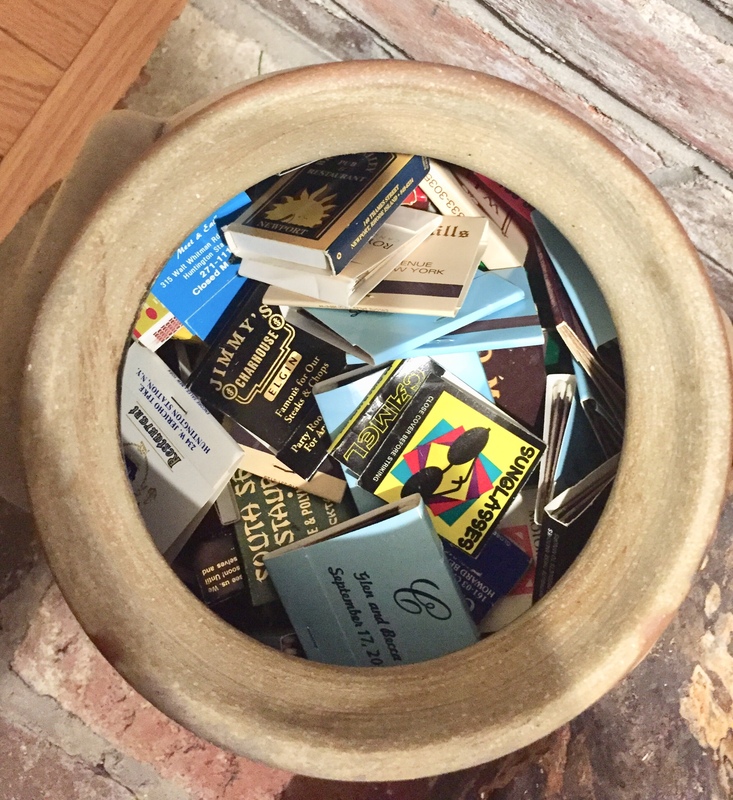 Growing up, everyone in our house always knew where to find the matches. And all the important documents. In the urns. One urn sat next to the fireplace and was filled with matchbooks from every wedding my parents had ever attended. Personalized matchbooks as a wedding favor were all the rage in the 1980s. Bob and Lisa, Steve and Diane, Kevin and another Lisa… they all wanted to make sure you remembered their special day when you were lighting up a cig and ignoring the Surgeon General. Since neither one of my parents smoked, they didn’t go through matches very quickly. So they got to remember Lisa and Kevin’s killer DJ and crab cakes for many, many moons. So many moons in fact that the matchbooks really needed a home of their own because eventually we ran out of space on the windowsill above the sink. The obvious solution, an urn. I don’t know why. I never actually questioned it. Neither did my brother. We just accepted the fact that the urn next to our fireplace did not hold the remains of a dear relative, but rather the remains of a really nice evening at the Westin in Stamford, Connecticut. Also the solution to all of our birthday cake lighting problems. 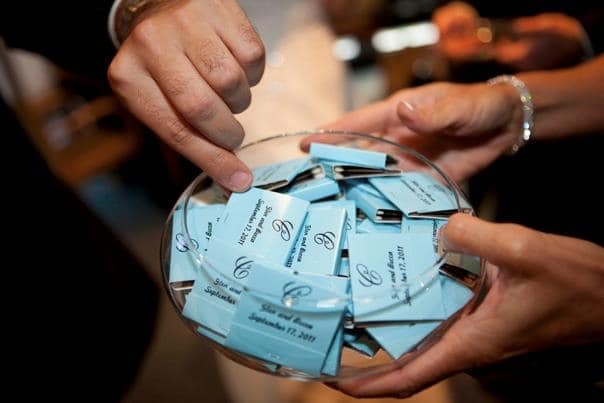 Fast forward to 2011 and matchbooks weren’t as popular of a wedding favor any more. Personalized napkins were still hanging in there. Little bags of candy maintained classic status. Even cameras as the table weren’t totally outdated. But matchbooks sales had seen a rapid decline in direct correlation to the rate at which people started to realize that they liked breathing clean air. But my father was really concerned that if Glen and I got married and there were no matchbooks everyone would forget it ever happened. We tried to convince him that the band was going to be really memorable. And that we picked a REALLY good cake. (Brownie cake, canolli filling – slay all day.) But Pops wasn’t having it. We were getting personalized matchbooks. If not for the guests, for the urn. For the record, our wedding guests obliged Pops quite nicely and there are only about 15 matchbooks left for the urn. Not bad. What’s Safer Than an Urn? The matchbook urn wasn’t the only urn in our house though… There were actually two urns by the fireplace. The second urn was probably weirder I guess. Even in a very digital world, we all have important documents that identify us to various government agencies. Think Social Security Cards and Passports. And in the 90s banking was much less interwebish and much more “can I write you a check”ish. So we had check books and check balancing books and other various financial forms that needed a safe home. But my OG family didn’t trust our socks to keep secrets. We trusted the urn. The important document urn. Literally every piece of paperwork our family would need in case of emergency was tucked away in this urn along with several years of birthday checks that were screwing up at least three Aunt’s check balancing book because banking hours were inconvenient. This urn got to go on top of the mantle instead of right next to the fire. So that was pretty smart I think. And I mean it had a lid, so things were pretty secure in there. WHY did my family have so many urns with so few people in them? WHY didn’t I ask more questions about this? I guess I could ask those questions now, but I won’t. And even given the opportunity earlier this year when my brother and I were talking to my parents about the urns, neither of us really dug into it. (Uncomfortable death pun not intended.) We just laughed. And laughed and laughed and laughed. I’m struggling with how to end this without being abrupt. Because it’s an odd story. So I think the best thing to say is I love you Merm, Pop, and T. Thanks for making me the big old weirdo that I am today. And I hope maybe someone reading this post will get a little sentimental about their wonky childhood home toilet, or staircase, or casserole and call their parents or siblings to say hey. Tell them I said hey too. I mean if it comes up, don’t force it. Every family has it quirks yours just happens to like urns. Like the match book story, I remember when that was all the thing to have at weddings. I really loved this post Becca! 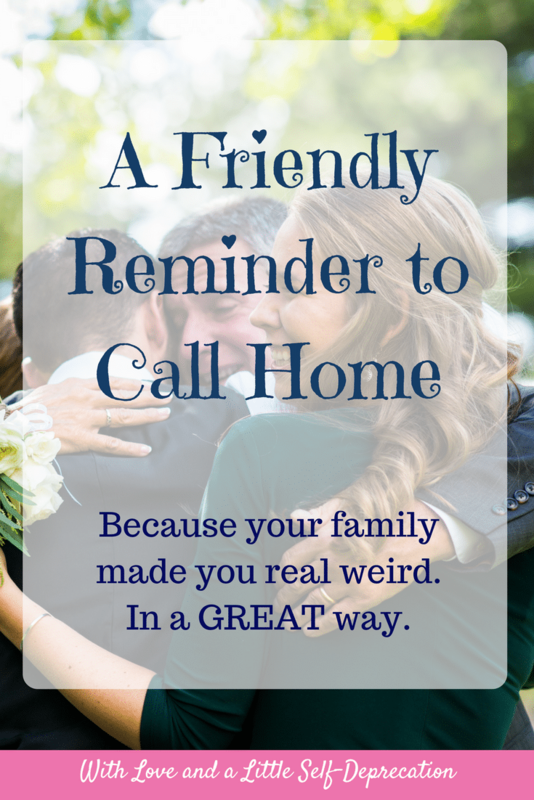 Every family does have some weird quirks! My mum has some tubular bells (the kind that hang down.) She’d play them every evening to let us know when it was dinner time. We have loads of family-specific language as well (I think they are mostly things that one of me or my siblings said when we were children, that just stuck.) My husband was sooo confused by conversations at my parents house until he started learning the lingo! I think ours would be clocks…grandfather clocks, Cuckoo clocks, clocks that make bird noises. No houseguest has ever gotten a good night’s rest with them, and no family member has gotten a good night’s sleep without them. Everytime I hear a clock chime, it reminds me of home. Love this is much!! That’s like the prime example! This is so funny!! I’m Becca’s mom and I grew up in a house of chiming clocks! I never noticed them then , but if I sleep at my parents house I sleep in 15 minutes spurts in between chimes! !